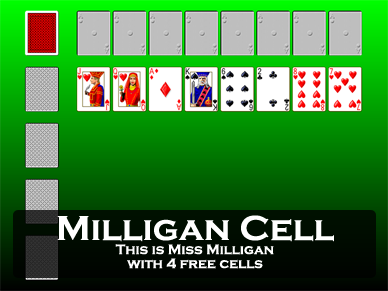 Screen shot of the game Miss Milligan from Pretty Good Solitaire. 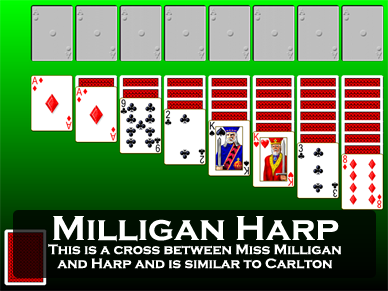 Miss Milligan is a 2 deck game of the Spider type, although it is quite different from Spider. At the start of the game, one card each is dealt out to 8 tableau piles. There are 8 foundation piles. The object is to found the Aces and build the foundation piles up in suit from Ace to King. 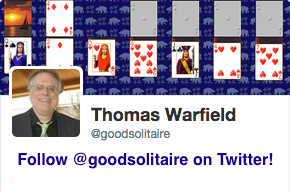 The game is won when all the cards are moved to the foundations. In the tableau, the piles are built down by alternate color. 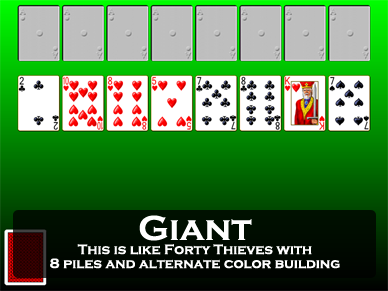 Groups of cards in descending sequence down by alternate color can be moved as a unit. Spaces can be filled only by Kings. The remainder of the cards form a stock. 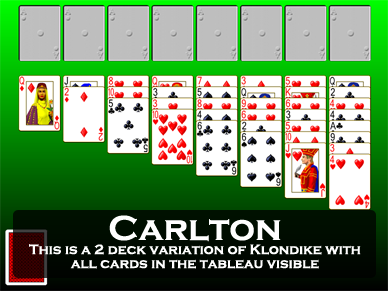 When play comes to a standstill, click on the stock to deal one card to each tableau pile. This dealing gives the game its Spider-like quality. When the stock is empty (all cards have been dealt out), an additional reserve pile becomes available. You can move any card or legal group of cards onto this reserve pile to free the cards below. These cards can then be moved to the foundations or back to the tableau, but you cannot play any other cards on them until you move all of the cards out of the reserve to make it empty. 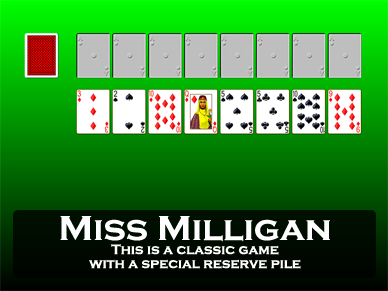 Miss Milligan is a challenging game. 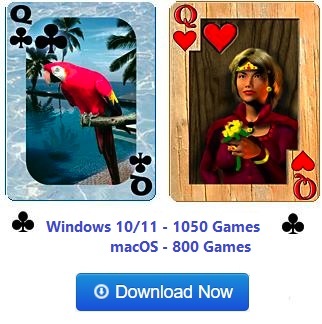 It is a game where alertness and strategy can make a big difference.